In serendipitous circumstances the Menai Wildflower Group may have played a part in the discovery of a new species of Hibbertia. In 2003 before the bulldozers were let loose to begin work on the Bangor Bypass, we sought permission from the RTA to remove some of the plants destined for destruction and were pleasantly surprised at the cooperation we received. The RTA took the time to put several of our members through an induction programme and provide us with helmets and jackets to conform to safety regulations. We removed a number of plants desired by our members such as ground orchids as well as the endangered Teratheca neglecta. We also took a cross section of species that we thought may survive the shock of being wrenched from their surroundings. These were taken to the ‘Tip Nursery’. This nursery is operated by Waste Services to re-vegetate the Lucas Heights Tip site with plants grown from locally collected seed. The MWFG helps propagate the plants and in return is allowed to use the facilities for its own projects. The plants were potted up and kept in the shade house until they recovered. In late 2004 Alan Fairley came to have a look at what we were doing and while perusing the ‘bypass refugees’ spotted an hibbertia in flower and stated to our surprise that it was something interesting and may be a new species. Alan took a plant with him and sent a sample to taxonomist Hellmut Toelken who is reviewing the genus. Toelken agreed that it seemed to be a new one; further samples have been prepared and sent to him for a full review. In the mean time we have been surveying the area around the bypass to see whether there are any left in the wild. So far we have found about 60 plants all along or near the east-west link corridor – in effect the south side of the Bangor-Menai ridge. But as a result of an article about it in Sutherlandshire’s Bushcare Link Margaret Bradhurst reported another 90 plants in Maandowie Reserve on the other side of the Woronora River. There may be other populations and so I would like to invite members in the area to keep an eye out for this species. This species is part of the H. stricta/riparia group. It is an upright to spreading shrub to 1 metre. The leaves are scattered, linear, usually 8-16mm by 1mm but sometimes longer on mature specimens. The margins are recurved right to the midrib. The stem has white stellate hairs. 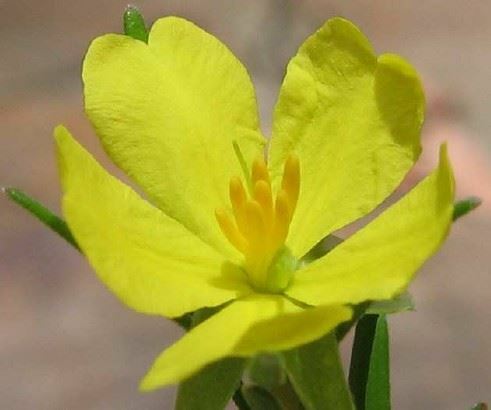 The flower is typical hibbertia - 5 yellow petals and usually 6, sometimes 8, stamens ALL to one side of 2 silky carpels. The sepals are mainly glabrous but with hairs on the margins. Specimens sighted so far grow on the sides of ridges and down into gullies in sandstone soils but not on the ridge tops. There is usually a watercourse or evidence of seepage nearby. They are undershrubs under She-oakes and gums particularly Allocasuarina littoralis and Angophora costata. Associated species include Micrantheum ericoides, Grevillea mucronulata, Platysace lanceolata, Actinotus minor, Goodenia species and Banksia spinulosa. The Menai Wildflower Group has joined Alan in approaching the relevant authorities to see what can be done about protecting the remnant population while we wait for a decision on the plants status. If this plant is given species status we of course would have no input into its naming but we refer to it, tongue in cheek, as bangorbypassii; Cas Liber has suggested that the latinised form deverticuli [‘of the bypass’ apparently] would be more acceptable. But to be fair fairleyii would be even better in recognition of Alan’s role in the conservation of this and so many other species. Could anyone who thinks they may have come across this species please contact Lloyd Hedges on 9543 1216. This is an edited version of an article which originally appeared in the journal Native Plants for NSW. You would think that for such an iconic plant as the Gymea Lily there would be plenty of information about it. But you would be wrong. The ecology of the Gymea Lily was first studied in 1928 but until recently little research has been done. In 2012 Sharon Bowen from the Dept. of the Environment & Heritage gave us a talk about her Masters thesis on the Gymea Lily and was able to share her knowledge with us. The Gymea Lily is part of the Doryanthaecae family which is closely related to plants of the Agave family. Its botanical name is Doryanthes excelsa which is derived from ‘doratos’ which means a spear, and excelsa which means high or far seen – this refers to the tall flower spike. The Gymea Lily has a strange distribution. It naturally grows along the coast of NSW from Corindi in the north to Wollongong in the south, however it is not common to all areas between these 2 places. Also there is a gap of 2 degrees latitude where no plants grow naturally (including between Port Jackson and Port Hacking). 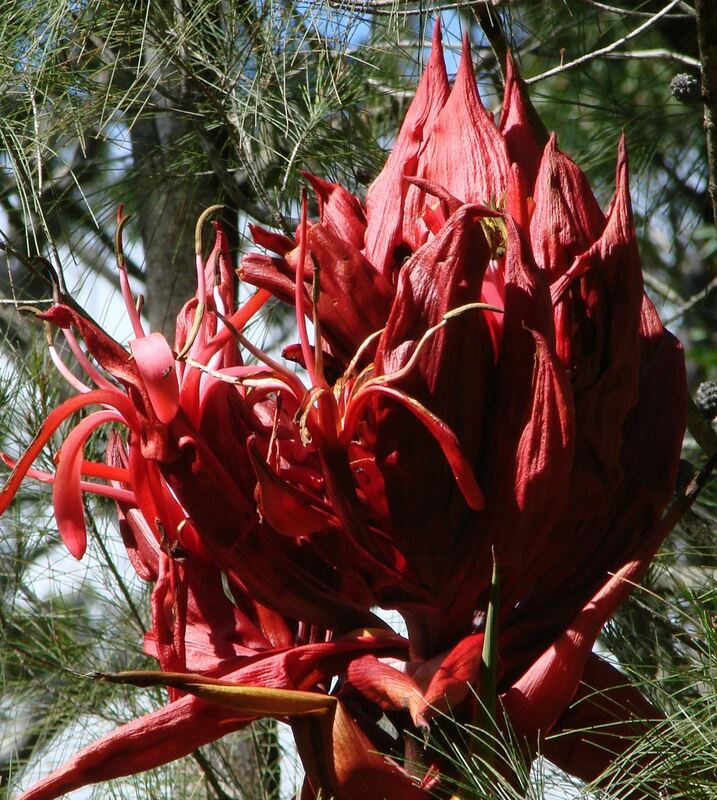 This unusual distribution led Sharon Bowen to study the niche ecology of the Gymea Lily. She found that D. excelsa has specific habitat requirements relating to substrate, topography and climate. Fire frequency and intensity are also important. Sharon observed that Gymea Lilies need moderately deep sandy, earthy soils, south to south-east facing slopes along creeks, gullies or sheltered plateau and ridges and grow in open dry sclerophyll forests which also support Angophora costata, Eucalyptus piperita, E. gummifera, E. sieberi or E. punctata. They also grow where Xanthorrhoea or Telopea are present and where there are moisture-loving groundcover species. Gymea Lilies are pollinated by honey-eating birds and bees and in order to attract these pollinators they have brightly coloured pinky-red flowers on tall flower stems. To carry out her research Sharon chose two separate populations: She sampled those in the Dharug National Park (60km north of Sydney) and compared to samples in the Royal National Park (36km south of Sydney). She made comparisons between the 2 areas in terms of 1.vegetation community structure and floristry 2. physical and chemical characteristics of the soil 3. seed germinability and early seedling growth rate, and 4. morphogenetic measurements – number of leaves, leaf dimensions, plant dimensions etc. She considered that there may be a genetic difference between these two populations. Sharon found that Gymea Lilies have a transient seed bank (ie once released the seeds are short-lived), but the seeds are viable and easily germinate. However, the seedlings are slow to grow, as is the adult plant. The Gymea Lily also requires low nutrient soil with a low pH of 4.1. In her research, Sharon found that growth rate of seedlings was retarded at higher levels of NPK. Sharon found that in response to fire the Gymea Lily is able to re-sprout if the top is damaged. However, due to its slow growth and production of flowers, if fires are too frequent it is unable to reproduce as often and this would reduce the genetic diversity of the population. Sharon concluded that the environmental niche of the Gymea lily is defined by a narrow range of environmental parameters; it persists in the environment by the longevity of individuals; it is a ancient and relict species from a wetter climate but has evolved to cope with drought rather than frequent fire and so the populations are confined to the areas of less fire. Sharon found no differences in the phenotype (observable hereditary characteristics arising from the interaction with their environment) between the 2 populations. Since her research the genetic material from Gymea Lilies in both areas has been tested by another researcher who confirmed that the 2 populations have the same DNA and so are the same species. Sharon gave a very informative talk which gave us better understanding of the Gymea Lily and why it is important to preserve this spectacular plant from threats such as urbanisation, frequent fire regimes, illegal harvesting of blooms for the floristry trade, and reduction in its genetic diversity.